Objective: To evaluate the efficacy and safety of monotherapy with adalimumab in patients with RA for whom previous DMARD treatment has failed. Methods: In a 26 week, double blind, placebo controlled, phase III trial, 544 patients with RA were randomised to monotherapy with adalimumab 20 mg every other week, 20 mg weekly, 40 mg every other week, 40 mg weekly, or placebo. The primary efficacy end point was ≥20% improvement in the ACR core criteria (ACR20 response). Secondary efficacy end points included ACR50, ACR70, EULAR responses, and the Disability Index of the Health Assessment Questionnaire (HAQ DI). Results: After 26 weeks, patients treated with adalimumab 20 mg every other week, 20 mg weekly, 40 mg every other week, and 40 mg weekly had significantly better response rates than those treated with placebo: ACR20 (35.8%, 39.3%, 46.0%, 53.4%, respectively v 19.1%; p⩽0.01); ACR50 (18.9%, 20.5%, 22.1%, 35.0% v 8.2%; p⩽0.05); ACR70 (8.5%, 9.8%, 12.4%, 18.4% v 1.8%; p⩽0.05). Moderate EULAR response rates were significantly greater with adalimumab than with placebo (41.5%, 48.2%, 55.8%, 63.1% v 26.4%; p⩽0.05). Patients treated with adalimumab achieved better improvements in mean HAQ DI than those receiving placebo (−0.29, −0.39, −0.38, −0.49 v −0.07; p⩽0.01). No significant differences were found between adalimumab and placebo treated patients for serious adverse events, serious infections, or malignancies. Injection site reaction occurred in 10.6% and 0.9% of adalimumab and placebo treated patients, respectively (p⩽0.05). Conclusion: Among patients with RA for whom previous DMARD treatment had failed, adalimumab monotherapy achieved significant, rapid, and sustained improvements in disease activity and improved physical function and was safe and well tolerated. Until the introduction of TNF antagonists, patients who did not respond to traditional DMARDs had few therapeutic options. Achieving success with TNF antagonist monotherapy in such patients would be a rigorous test of efficacy. The objective of this double blind, placebo controlled, phase III study was to evaluate the efficacy and safety of adalimumab monotherapy given as subcutaneous (sc) injections in patients with active RA for whom treatment with at least one DMARD had failed. Patients aged 18 years or older were recruited from 52 centres in Europe, Canada, and Australia. Eligible patients met the diagnostic criteria for RA established by the American College of Rheumatology (ACR),12,13 treatment with at least one DMARD had previously failed, and they had active disease defined as ⩾12 tender joints based on a 68 joint assessment, ⩾10 swollen joints based on a 66 joint evaluation, and either an erythrocyte sedimentation rate (ESR) ⩾28 mm/1st h or a serum C reactive protein (CRP) concentration ⩾20 mg/l. A negative pregnancy test and the use of a reliable contraceptive method were mandatory in women of childbearing potential. Exclusion criteria included joint surgery within 2 months before screening or infection requiring admission to hospital or treatment with intravenous (iv) antibiotics within 1 month before screening. Patients were excluded if they had received treatment with either an intra-articular or intramuscular corticosteroid within 1 month before the study or an investigational small molecule drug or biological agent within 2 months or 6 months before screening, respectively. Patients with impaired renal or hepatic function, or a history of tuberculosis as shown by radiographs, were excluded from the study. All patients were required to give written informed consent. This study was a 26 week, double blind, placebo controlled, phase III randomised trial of adalimumab monotherapy performed between January 2000 and June 2001. Ethics committees (in Europe and Australia) and research committees (in Canada) approved the trial at their respective study sites. After screening and baseline assessments, study visits were conducted every other week during the first month, monthly thereafter, and at week 26. Patients who dropped out were followed up at 1, 2, 3, and 6 months after treatment. Patients were randomised in a blinded fashion during the baseline visit in blocks of five patients each to one of the following five treatment arms: adalimumab 20 mg given subcutaneously (sc) every other week (with placebo injected on the alternate week), adalimumab 20 mg sc weekly, adalimumab 40 mg sc every other week (with placebo injected on the alternate week), adalimumab 40 mg sc weekly, or placebo weekly. Treatment allocation was done in a double blind fashion by a computer generated randomisation list, and blinding was achieved by the packaging procedure for the study drug. The study drug was provided in ready to use unit dose vials of 1.6 ml injectable solution containing adalimumab 20 mg, adalimumab 40 mg, or placebo. Patients were instructed on self injection techniques. Patients taking traditional DMARDs at the time of recruitment were required to undergo a 4 week washout period before the initial injection of the study drug. Use of non-steroidal anti-inflammatory drugs (NSAIDs) and oral corticosteroids before the study was allowed at stable pre-enrolment doses and routes of administration, with a daily dose limit equivalent to prednisolone 10 mg. Analgesics such as propoxyphene, codeine, or aspirin were permitted, but not within 12 hours of study visits. Adalimumab or placebo treated patients who had increased inflammatory synovitis or <10% improvement in tender and swollen joint counts after at least 8 weeks of treatment could have elected to enter a rescue arm, during which the study drug could have been discontinued and doses of NSAIDs or corticosteroids could have been increased. In addition, other DMARDs could have been initiated as rescue treatment at the investigator’s discretion. Patients entering the rescue arm as well as those completing the 26 week trial could subsequently have elected to enter an open label adalimumab continuation study. The primary efficacy end point was the rate of ACR20 response (⩾20% improvement in the ACR core criteria). Secondary efficacy end points included the ACR50 and ACR70 response rates and improvements in ACR core components (patient global assessment of disease activity, physician global assessment of disease activity, patient assessment of pain, the Disability Index of the Health Assessment Questionnaire (HAQ DI), and serum levels of CRP).13,14 Additionally, clinical response was measured by changes in the disease activity score 28 (DAS28), a composite score (scale 2–10) defined by criteria established by the European League Against Rheumatism (EULAR).15–20 No EULAR response was defined as a decrease in DAS28 of ⩽0.6 or a decrease >0.6 but ⩽1.2 with an attained DAS28 of >5.1. A good EULAR response was defined as a decrease in DAS28 of >1.2 and an attained DAS28 of ⩽3.2. Remaining patients were classified as moderate EULAR responders. Safety was evaluated based on adverse event data (for example, type, severity, time of occurrence, time to resolution) provided by physical examinations and patient self reporting. Safety assessments were conducted at screening, baseline, and every study and follow up assessment. Patients were routinely tested for the presence of antibodies against adalimumab with a sensitive double antigen, enzyme linked immunosorbent assay (ELISA). A positive signal for antibodies against adalimumab was defined as a titre >20 ng/ml with <50% suppression when 10% human serum was added to a sample. Patients were regularly monitored for antinuclear antibodies (ANAs) and, when ANA titres were raised from baseline, for anti-double-stranded DNA (anti-dsDNA) antibodies. Positive ANAs were defined as titres ⩾1/80, and positive anti-dsDNA levels as ⩾25 kU/l. A sample size of 90 patients in each treatment group was required to detect a difference of 30% in ACR20 response rates between an adalimumab dose group and placebo (with a predicted ACR20 response rate of 20% for placebo and with statistical power of at least 95% probability). The overall level of significance was set at p = 0.05. The study was not powered to detect differences between individual adalimumab groups. To account for the few patients who might not be evaluable for any reason, the sample size was set at 100 patients in each treatment group. Demographic and baseline characteristics were summarised by descriptive statistics and compared between treatment groups to assess baseline homogeneity using one way analysis of variance or the Kruskal-Wallis test for continuous variables and the Cochran-Mantel-Haenszel test or Pearson’s χ2 test for discrete variables. An intention to treat analysis was performed that included patients who were randomised and who received at least one injection of the randomised study drug. The response rates for the primary efficacy end point (ACR20 at week 26) for each adalimumab group were compared with that of placebo using a two sided Pearson’s χ2 test. The Bonferroni-Holm procedure was applied to account for multiplicity of testing. Improvement in RA (that is, fulfilment of ACR20 response criteria) was defined as change from baseline. Patients not completing the trial (that is, who were withdrawn or required rescue) despite fulfilling ACR criteria were considered non-responders upon withdrawing or entering rescue. Improvements in the seven ACR core components were compared between adalimumab and placebo treated patients using an analysis of covariance model, with baseline values as covariates. No α correction for multiple testing was applied to secondary efficacy variables. Comparisons of the active treatment groups with placebo were performed on the basis of the adjusted means resulting from these models. There were no statistically significant differences in the demographic characteristics and baseline disease activity between the treatment groups (table 1). Most patients were female (77.4%), and the overall mean age was 53 years. At baseline, these patients had longstanding, severe RA and previous DMARD treatment had failed. Upon entering the study, patients had experienced RA for an overall average of 11 years. Tender and swollen joint counts averaged 34.4 and 19.8, respectively; the mean score for the HAQ DI was 1.9; the mean DAS28 was 7.07; and 81.6% of patients tested positive for rheumatoid factor. Additionally, the mean CRP concentration was 51.7 mg/l, and the mean ESR was 53.5 mm/1st h. An average of 3.7 DMARDs had been unsuccessfully used in the treatment of patients. The majority of patients (71.5%) had been unsuccessfully treated with three or more DMARDs. The most common previously used DMARDs included MTX, sulfasalazine, antimalarial drugs, and parenteral gold, which had failed in 90%, 60%, 59%, and 52% of randomised patients, respectively. A total of 827 patients with RA were screened. 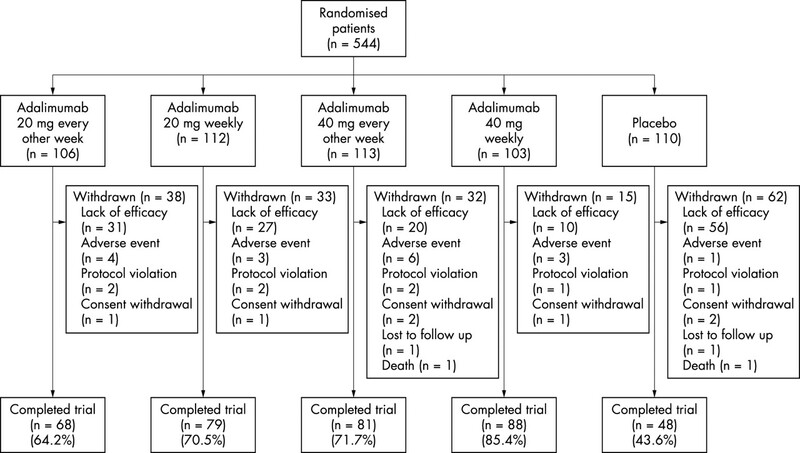 Of those, 544 patients met entry criteria and were randomly allocated to five treatment groups: 106 patients (19.5%) to adalimumab 20 mg every other week, 112 (20.6%) to adalimumab 20 mg weekly, 113 (20.8%) to adalimumab 40 mg every other week, 103 (18.9%) to adalimumab 40 mg weekly, and 110 (20.2%) to placebo (fig 1). Withdrawals occurred in 118/434 (27.2%) adalimumab treated patients and 62/110 (56.4%) placebo treated patients. ACR20, ACR50, and ACR70 response rates (observed values) for all dosing regimens of adalimumab were significantly better than with placebo at week 26 (table 2) and at most of the other evaluation points (fig 2) (p⩽0.05). ACR20 response rates at week 26, the primary efficacy end point, were 35.8%, 39.3%, 46.0%, and 53.4% with adalimumab 20 mg every other week, 20 mg weekly, 40 mg every other week, and 40 mg weekly, respectively, versus 19.1% with placebo (p⩽0.01). ACR70 response rates for adalimumab 40 mg every other week were significantly better at all evaluation points and for adalimumab 40 mg weekly at most evaluation points compared with placebo (p⩽0.05) (fig 2). The sample size did not allow statistically meaningful comparisons between the individual adalimumab regimens. For all adalimumab treatment groups combined, there was no significant difference in ACR20 response rates at week 26 between patients with or without concomitant corticosteroid treatment (44.5% (133/299) v 41.5% (56/135), respectively), suggesting that concomitant corticosteroid treatment did not affect the response to adalimumab. Percentages of patients treated with adalimumab or placebo who had at least 20%, 50%, and 70% improvements in ACR response criteria (ACR20, ACR50, ACR70; observed values). Comparison versus placebo (Pearson’s χ2 test): *p⩽0.05; †p⩽0.01; ‡p⩽0.001. 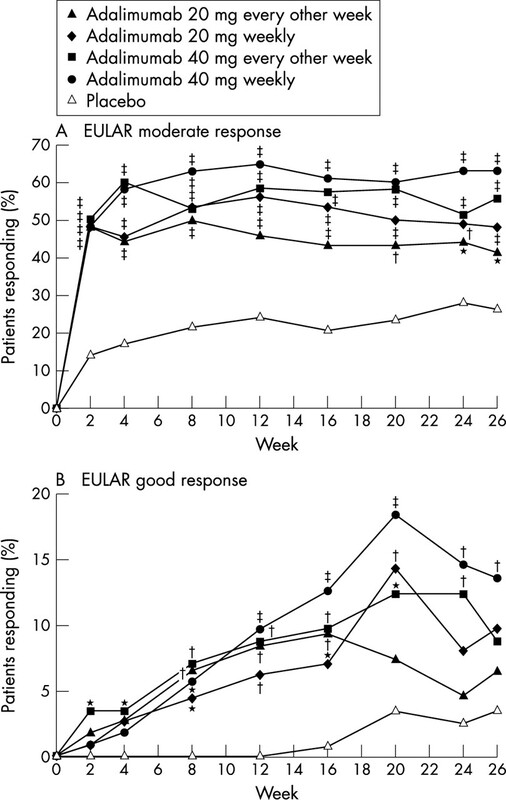 Consistent with ACR responses, at least moderate (both moderate and good) EULAR response rates (observed values) for all adalimumab regimens were significantly better than for placebo at week 26 (table 2) and at all other evaluation points (fig 3) (p⩽0.05). At least moderate EULAR response rates were 41.5%, 48.2%, 55.8%, and 63.1% with adalimumab 20 mg every other week, 20 mg weekly, 40 mg every other week, and 40 mg weekly, respectively, compared with 26.4% with placebo (p⩽0.05). At week 26, significantly more patients treated with adalimumab 40 mg weekly versus those treated with placebo achieved a good EULAR response (p⩽0.01) (table 2). Percentages of patients treated with adalimumab or placebo who had improvements in the European League Against Rheumatism (EULAR) response criteria (observed values). Comparison versus placebo (Pearson’s χ2 test): *p⩽0.05; †p⩽0.01; ‡p⩽0.001. Significant improvements in ACR20, ACR50, and at least moderate EULAR response rates with each adalimumab regimen compared with placebo (p⩽0.05) were evident as early as week 2, the first evaluation point (table 2; figs 2 and 3). At week 2, ACR20 response rates were 37.7%, 38.4%, 35.4%, and 33.0% with respective adalimumab dosages compared with 7.3% with placebo (p⩽0.001). Significant improvements versus placebo in ACR70 and good EULAR response rates were evident at week 2 with adalimumab 40 mg every other week (p⩽0.05) (table 2; figs 2 and 3). Overall, in adalimumab treated patients, ACR20 and at least moderate EULAR response rates peaked at approximately week 12 and remained at that level thereafter, whereas ACR50, ACR70, and good EULAR response rates continued to rise (figs 2 and 3). At week 26, ACR core component and DAS28 response rates were significantly greater with adalimumab 40 mg every other week and weekly than with placebo (p⩽0.001) (table 3). Adalimumab 20 mg every other week and weekly reached significance for most of these end points (p⩽0.05) (table 3). After 26 weeks of treatment, the tender joint count decreased by 35.5%, 42.4%, 37.4%, and 48.0% with respective adalimumab doses in contrast with a 9.5% decrease with placebo. The swollen joint count decreased by 28.0%, 34.6%, 37.0%, and 40.1% with respective adalimumab doses compared with a 7.4% decrease with placebo. HAQ DI decreased by 14.7%, 18.5%, 21.3%, and 28.7% with respective adalimumab doses, while increasing 1.8% with placebo. Patients treated with respective adalimumab doses achieved significantly better improvements in mean HAQ DI (−0.29, −0.39, −0.38, and −0.49) versus placebo (−0.07) (p⩽0.01). Adalimumab was well tolerated, and most adverse events were mild or moderately severe. Significantly more adalimumab treated patients (429/434; 98.8%) than placebo treated patients (105/110; 95.5%) reported at least one adverse event (p⩽0.05). However, the mean duration of exposure to study drug was greater with adalimumab (162.0 days) than with placebo (133.9 days). To adjust for the higher rate of withdrawals and shorter amount of treatment time in the placebo group, adverse events were also analysed by the total number of patients experiencing a particular adverse event per total years of treatment (patients/patient-year). Based on this analysis, the occurrence of adverse events was comparable between adalimumab treated patients (2.23 patients/patient-year) and placebo treated patients (2.60 patients/patient-year). Among the most common adverse events (⩾10% in any treatment group), headache, rash (at a site other than the injection site), injection site reaction (localised erythema, itching, haemorrhage, pain, or swelling), and pruritus occurred significantly more often in adalimumab treated patients than placebo treated patients (p⩽0.05) (table 4). Injection site reactions occurred in 10.6% of adalimumab treated patients and 0.9% of placebo treated patients (p⩽0.05). There was no statistically significant difference in the rates of serious adverse events between adalimumab treated patients (53/434; 12.2%) and placebo treated patients (16/110; 14.5%). Furthermore, there was no dose-response effect with adalimumab for serious adverse events, which were reported in 10.4%, 16.1%, 11.5%, and 10.7% of patients treated with adalimumab 20 mg every other week, 20 mg weekly, 40 mg every other week, and 40 mg weekly, respectively. The rates of serious infections were statistically similar between adalimumab treated patients (10/434; 2.3%) and placebo treated patients (0/110; 0%). All cases of serious infection were treated and resolved during the course of the trial. There were no cases of primary or reactivation tuberculosis among adalimumab treated patients during the study. Malignancies occurred at statistically similar rates with adalimumab (4/434; 0.9%) and placebo (1/110; 0.9%). Four deaths occurred during the study, including three patients treated with adalimumab (metastatic adenocarcinoma, cholangiocarcinoma, and myocardial infarction) and one with placebo (complications of a bowel obstruction), all of which were judged either unrelated or unlikely to be related to the study drug. Conversion from ANA negative at baseline to positive at week 26 occurred in 12.2% (53/434) of adalimumab treated patients and 5.5% (6/110) of placebo treated patients, whereas 10.4% (45/434) of adalimumab treated patients and 8.2% (9/110) of placebo treated patients converted from ANA positive to negative. Over the course of the study, 12% of adalimumab treated patients tested positive for antibodies against adalimumab; however, there were no differences in the pattern or frequency of adverse events between patients with or without these antibodies. Among all adalimumab treatment groups combined, the ACR20 response rate at week 26 was numerically lower for patients who were positive for adalimumab antibodies than for those who were negative, but among patients treated with the recommended dose21 of 40 mg every other week, there was no statistically significant difference in ACR20 response rates at week 26 between both groups. In this study, adalimumab, the first human anti-TNF monoclonal antibody to be investigated for the treatment of RA, was found to be effective in reducing disease activity and in improving functional capacity in patients with severe, longstanding RA for whom previous DMARD treatment had failed. Despite disease severity in these patients, adalimumab monotherapy achieved significant, rapid responses, which were evident as early as week 2, the first evaluation, and were sustained or improved throughout the study. Significant numbers of patients in all four adalimumab groups had improved clinically, even with the most stringent response criteria (ACR70 response). Although the study was not powered to detect statistical differences among the adalimumab treatment groups, there appeared to be a trend towards better efficacy with the adalimumab 40 mg dose groups. Overall, the weekly 40 mg dose seemed to offer benefits over the every other week 40 mg dose, although such differences were less pronounced than those between the 20 and 40 mg doses. Therefore, the clinical implications drawn from these data are in agreement with the current dosing recommendations (that is, the recommended dose of 40 mg every other week, with some patients not taking concomitant MTX deriving additional benefit from increasing the dosing frequency to 40 mg every week21). The results of this study show that it is possible to successfully treat people with severely active RA for whom many treatment regimens have failed. Adalimumab monotherapy provided rapid, sustained improvement in the signs and symptoms of this disease, despite the fact that this study enrolled one of the most severely afflicted patient groups ever studied in RA, as shown by eligibility analyses of other trials. For example, an eligibility analysis of a phase III trial of infliximab,25 in which the baseline HAQ scores ranged from 1.5 to 1.8 (versus 1.9 in our trial), found that only a small percentage (~5%) of patients with long term RA, as defined by ACR criteria, met the inclusion criteria for disease severity.26 Moreover, in a phase II study of etanercept, in which the baseline HAQ scores ranged from 1.6 to 1.7, ACR responses at 6 months for patients receiving active treatment were comparable to those for patients receiving adalimumab in this trial (for example, ACR70 responses of up to 18.4% for adalimumab v 15% for etanercept),27 thus signifying the degree of clinical success demonstrated in our study with such a patient group. The doses of adalimumab (20 and 40 mg) used in this study were selected based on the findings of a phase II, dose ranging monotherapy study with weekly sc injections of adalimumab 20, 40, and 80 mg in patients non-responsive to traditional DMARD treatment.28 That study showed that the efficacy provided by the 40 mg weekly dose was similar to that provided by the 80 mg weekly dose. Expanding upon the results of that study, our investigation included the recommended adalimumab dose (40 mg every other week). There were no statistically significant differences between adalimumab treated patients and placebo treated patients in the rates of serious adverse events (12.2% v 14.5%, respectively). Moreover, a dose-response effect with adalimumab for serious adverse events was not evident. There was no statistically significant difference between adalimumab and placebo treated patients in the rates of serious infection (2.3% v 0%, respectively), and no cases of primary or reactivation tuberculosis were seen during the study among adalimumab treated patients. Despite such results, it should be noted that patients treated with TNF antagonists are at increased risk of developing serious infections, including tuberculosis.32,33 Patients should be screened for latent tuberculosis infection before starting treatment with a TNF antagonist. In conclusion, among patients with RA for whom previous DMARD treatment had failed, adalimumab monotherapy achieved significant, rapid, and sustained improvements in disease activity and improved physical function while being safe and well tolerated. Responses were higher overall for the adalimumab 40 mg dose regimens. Our findings suggest that adalimumab monotherapy is a therapeutic option for patients with longstanding, severe RA when previous DMARD treatment has failed. Financial support for the study was provided by Abbott GmbH & Co KG, Ludwigshafen, Germany, and Abbott Laboratories, Abbott Park, Illinois, USA. The authors gratefully acknowledge the investigators and co-investigators who participated in this phase III trial: Australia: Dr P Bird, Dr P Nash, Dr D Velvicic, Dr P Ryan, Dr K Pile, Dr P Hanrahan, Dr G Littlejohn, Dr G Major, Dr J Bleasel, Dr P Vecchio. Austria: Univ. Doz. Dr A Dunky, Dr W Ebner, Dr K Machold, Dr M Köller. Belgium: Professor Dr M Malaise, Dr C Ribbens, Professor Dr E Veys, Dr F van den Bosch. Canada: Dr W Bensen, Dr Canvin, Dr Robinson, Dr Hitchon, Dr Chalmers, Dr A Cividino, Dr B Haraoui, Dr Choquette, Dr Rich, Dr Raynault, Dr M Khraishi, Dr Atkins, Dr Baker, Dr A Russell, Dr Aaron, Dr Homick, Dr Maksymowych, Dr R Goodman, Dr J Pope, Dr White. France: Professor Dr M Dougados, Dr Nguyen, Professor Dr O Meyer, Dr C George, Professor Dr J Sany, Dr V Ferrazzi, Professor Dr Tebib, Professor Dr J Sibilia, Dr Limbach, Professor Dr MC Boissier, Dr Guèdes. Germany: Professor Dr G R Burmester, Dr S Scholze, Professor Dr J R Kalden, Dr Grünke, Dr C Antoni, Professor Dr J Kekow, Dr C Kühne, Dr M Kekow, Professor Dr HH Peter, Dr E Sandrock, Professor Dr R Rau, Dr P Alborz, Professor Dr M Schattenkirchner, Dr C Böger, Professor Dr J Wollenhaupt, Dr Dansmann, Professor Dr H Zeidler, Dr E Riechers. Great Britain: Professor Dr Paul Bacon, Dr ECC Rankin, Professor Dr P Emery, Dr K Ahmed, Professor Dr David Isenberg, Dr S Begum, Professor Dr D Blake, Dr V Birkett. Greece: Professor Dr FN Skopouli, Professor Dr A Tzioufas, Dr G Linardaki, Professor Dr L Settas, Dr Roussou. Italy: Professor Dr S Bombardieri, Dr P Migliorini, Dr L Riente, Professor Dr M Cutolo, Dr A Sulli, Professor Dr S Todesco, Dr U Fiocco, Dr C Rigon. The Netherlands: Professor Dr FC Breedveld, Dr EGM Kolmann, Professor Dr LBA van de Putte, Dr MC Creemers, Professor Dr JW Bijlsma, Dr N de Vries, Dr N Jamangier. Spain: Dr J A Jover, Dr E Pato, Dr I Morado, Dr G Herrero-Beaumont, M de Jorge. Switzerland: Prof Dr B Michel, Dr D Frey. Lee DM, Weinblatt ME. Rheumatoid arthritis. Lancet2001;358:903–11. American College of Rheumatology Subcommittee on Rheumatoid Arthritis Guidelines. Guidelines for the management of rheumatoid arthritis: 2002 update. Arthritis Rheum2002;46:328–46. Furst DE, Keystone EC, Breedveld FC, Kalden JR, Smolen JS, Antoni CE, et al. Updated consensus statement on tumour necrosis factor blocking agents for the treatment of rheumatoid arthritis and other rheumatic diseases (April 2001). Ann Rheum Dis2001;60 (suppl III):iii2–5. Elliott MJ, Maini RN, Feldmann M, Long-Fox A, Charles P, Bijl H, et al. Randomised double-blind comparison of chimeric monoclonal antibody to tumour necrosis factor alpha (cA2) versus placebo in rheumatoid arthritis. Lancet1994;344:1105–10. Moreland LW, Baumgartner SW, Schiff MH, Tindall EA, Fleischmann RM, Weaver AL, et al. Treatment of rheumatoid arthritis with a recombinant human tumor necrosis factor receptor (p75)-Fc fusion protein. N Engl J Med1997;337:141–7. Salfeld J, Kaymakçalan Z, Tracey D, Roberts A, Kamen R. Generation of fully human anti-TNF antibody D2E7 [abstract]. Arthritis Rheum1998;41 (suppl 9):S57. den Broeder AA, Joosten LA, Saxne T, Heinegard D, Fenner H, Miltenburg AM, et al. Long term anti-tumour necrosis factor alpha monotherapy in rheumatoid arthritis: effect on radiological course and prognostic value of markers of cartilage turnover and endothelial activation. Ann Rheum Dis2002;61:311–18. Weisman MH, Moreland LW, Furst DE, Weinblatt ME, Keystone EC, Paulus HE, et al. Efficacy, pharmacokinetic, and safety assessment of adalimumab, a fully human anti-tumor necrosis factor-alpha monoclonal antibody, in adults with rheumatoid arthritis receiving concomitant methotrexate: a pilot study. Clin Ther2003;25:1700–21. Barrera P, Joosten LA, den Broeder AA, van de Putte LB, van Riel PL, van den Berg WB. Effects of treatment with a fully human anti-tumour necrosis factor α monoclonal antibody on the local and systemic homeostasis of interleukin 1 and TNF α in patients with rheumatoid arthritis. Ann Rheum Dis2001;60:660–9. Barrera P, van der Maas A, van Ede AE, Kiemeney BA, Laan RF, van de Putte LB, et al. Drug survival, efficacy and toxicity of monotherapy with a fully human anti-tumour necrosis factor-alpha antibody compared with methotrexate in long-standing rheumatoid arthritis. Rheumatology (Oxford)2002;41:430–9. Felson DT, Anderson JJ, Boers M, Bombardier C, Chernoff M, Fried B, et al. The American College of Rheumatology preliminary core set of disease activity measures for rheumatoid arthritis clinical trials. Arthritis Rheum1993;36:729–40. van Riel PL, van Gestel AM, van de Putte LB. Development and validation of response criteria in rheumatoid arthritis: steps towards an international consensus on prognostic markers. Br J Rheumatol1996;35 (suppl 2):4–7. van Gestel AM, Prevoo MLL, van’t Hof MA, van Rijswijk MH, van de Putte LBA, van Riel PLCM. Development and validation of the European League Against Rheumatism response criteria for rheumatoid arthritis. Comparison with the preliminary American College of Rheumatology and the World Health Organization/International League Against Rheumatism Criteria. Arthritis Rheum1996;39:34–40. van Riel PLCM, van Gestel AM, Scott DL, on behalf of the EULAR Standing Committee for International Clinical Studies Including Therapeutic Trials. The EULAR handbook of clinical assessments in rheumatoid arthritis. Alpen an den Rijn. The Netherlands: Van Zuiden Communications, 2000. Prevoo MLL, van’t Hof MA, Kuper HH, van Leeuwen MA, van de Putte LBA, van Riel PLCM. Modified disease activity scores that include twenty-eight-joint counts. Development and validation in a prospective longitudinal study of patients with rheumatoid arthritis. Arthritis Rheum1995;38:44–8. van der Heijde DMFM, van’t Hof MA, van Riel PLCM, Theunisse LAM, Lubberts EW, van Leeuwen MA, et al. Judging disease activity in clinical practice in rheumatoid arthritis: first step in the development of a disease activity score. Ann Rheum Dis1990;49:916–20. van der Heijde DMFM, Jacobs JWG. The original “DAS” and the “DAS28” are not interchangeable: comment on the articles by Prevoo et al [letter]. Arthritis Rheum1998;41:942–3. Humira™ (adalimumab) [package insert]. North Chicago, IL: Abbott Laboratories, 2004. Goldsmith CH, Boers M, Bombardier C, Tugwell P, for the OMERACT Committee. Criteria for clinically important changes in outcomes: development, scoring and evaluation of rheumatoid arthritis patient and trial profiles. J Rheumatol1993;20:561–5. Plant MJ, Williams AL, O’Sullivan MM, Lewis PA, Coles EC, Jessop JD. Relationship between time-integrated C-reactive protein levels and radiologic progression in patients with rheumatoid arthritis. Arthritis Rheum2000;43:1473–7. Welsing PM, van Gestel AM, Swinkels HL, Kiemeney LA, van Riel PL. -The relationship between disease activity, joint destruction, and functional capacity over the course of rheumatoid arthritis. Arthritis Rheum2001;44:2009–17. Maini R, St Clair EW, Breedveld F, Furst D, Kalden J, Weisman M, et al. Infliximab (chimeric anti-tumour necrosis factor α monoclonal antibody) versus placebo in rheumatoid arthritis patients receiving concomitant methotrexate: a randomised phase III trial. Lancet1999;354:1932–9. Sokka T, Pincus T. Eligibility of patients in routine care for major clinical trials of anti-tumor necrosis factor α agents in rheumatoid arthritis. Arthritis Rheum2003;48:313–18. Moreland LW, Schiff MH, Baumgartner SW, Tindall EA, Fleischmann RM, Bulpitt KJ, et al. Etanercept therapy in rheumatoid arthritis: a randomized, controlled trial. Ann Intern Med1999;130:478–86. van de Putte LBA, Rau R, Breedveld FC, Kalden JR, Malaise MA, Schattenkirchner M, et al. Efficacy and safety of the fully human anti-TNF-α monoclonal antibody, adalimumab (D2E7), in DMARD-refractory patients with rheumatoid arthritis: a 12-week, phase II study. Ann Rheum Dis2003;62:1168–77. Wells AF, Kupper H, Fischkoff S, Chartash E. Incidence of injection-site reactions associated with adalimumab (D2E7) given subcutaneously for at least 6 months: a retrospective analysis of 4 phase II/III clinical trials [abstract]. Arthritis Rheum2002;46 (uppl 9):S171. Enbrel® (etanercept) [package insert]. Seattle, WA: Immunex Corporation, 2002. Kineret™ (anakinra) [package insert]. Thousand Oaks, CA: Amgen, 2001. Keane J, Gershon S, Wise RP, Mirabile-Levens E, Kasznica J, Schwieterman WD, et al. Tuberculosis associated with infliximab, a tumor necrosis factor alpha-neutralizing agent. N Engl J Med2001;345:1098–104. Kroesen S, Widmer AF, Tyndall A, Hasler P. Serious bacterial infections in patients with rheumatoid arthritis under anti-TNF-alpha therapy. Rheumatology (Oxford)2003;42:617–21. F A Wollheim was the editor for this paper.